“draw” before anyone takes you seriously. Even if the style is abstract expressionism, many art buyers want to know that the artist has skills, and that she could paint realistically if the mood caught her. A look at Pablo Picasso’s early work proves the point. He didn’t just jump to cubism, it was a process. Certainly he gained respect and notoriety along the way. He was awesome like that. 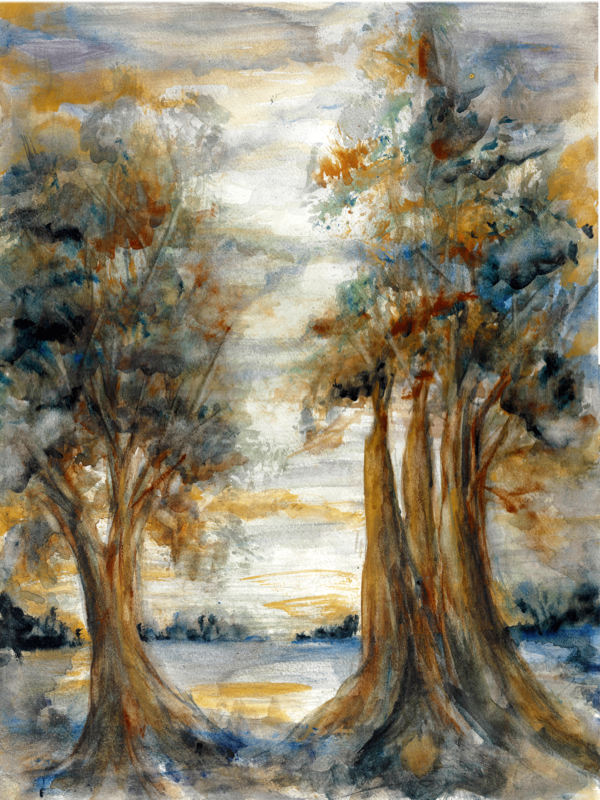 I consider Autumn Swamp, my original painting featured above to be figurative. It represents forms that are recognizably derived from life, stimulates a mood in the beholder, but is not photo-realistic. This painting below, entitled Autumn Calling, is inspired by the same scene in my creative psyche. Of course, some folks may completely reject the figuratism and say it’s completely abstract expression. There’s an interesting article about Abstract vs. Figurative Art published by www.TheArtStory.org that provides some very interesting definitions and examples from more famous artists than I.
I’d love to know what your thoughts and preferences are. Please leave a comment or share this post.